Well, I hope all you readers didn't give up on me! Seems forever since I've published a new post. Warm weather sure has been keeping me as busy as all get out, so I've gotten a bit behind on blogging. 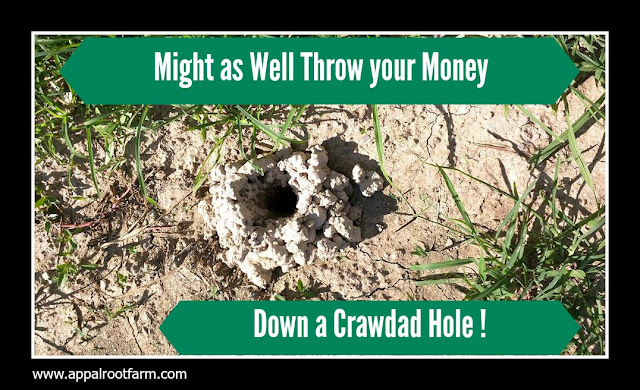 Don't forget that in between posts you can keep up with Appalroot Farm on social media. I post positive news from Appalachia, counter stereotypes, share beautiful mountain photos, and do my best to inspire a celebration of our people and culture. Follow along with the links below to keep up on all the latest! Speaking of celebrating...summertime gatherings and celebrations are some of the best! And great food helps make the celebrating all the more memorable. And, oh goodness, have I got a yummy summertime dish just perfect for all your events this season! This dish works great for barbecues, potlucks, family reunions, and you name it. But what's more, you can make this dish ahead of time, and that even makes it a handy but special addition to a busy weeknight meal. 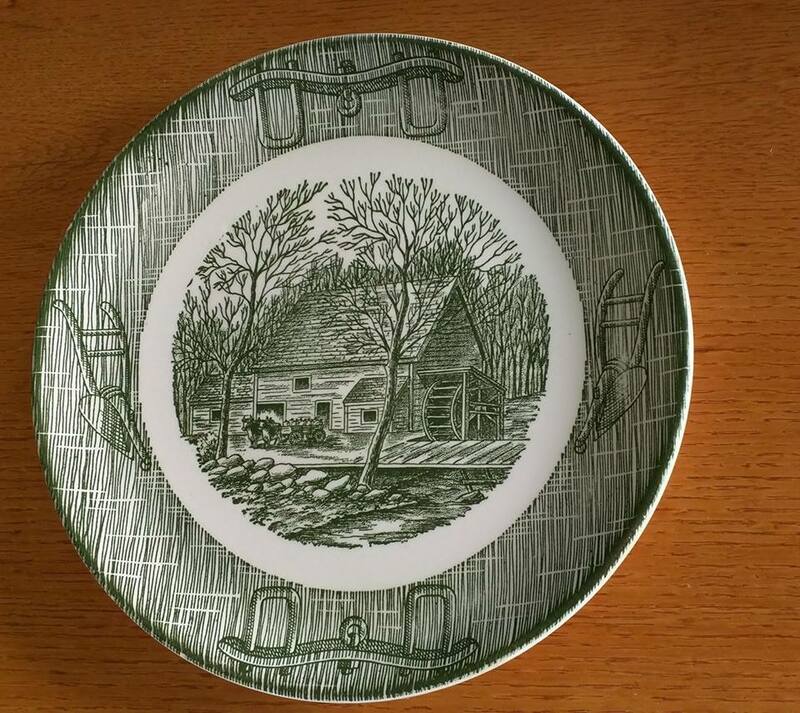 So there are a gazillion great things about this dish....but what I love about it more than anything is that it's based on a dish that my dear, sweet mamaw used to make. 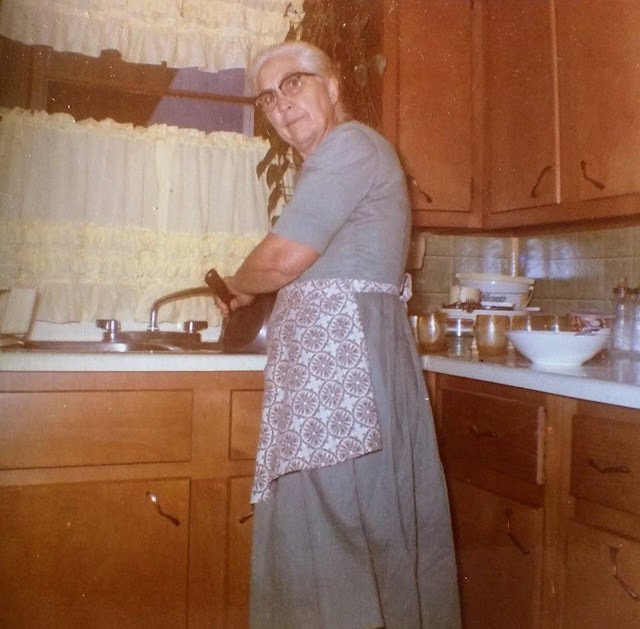 And as you've heard me mention before, my mamaw was sure no slouch in the kitchen! 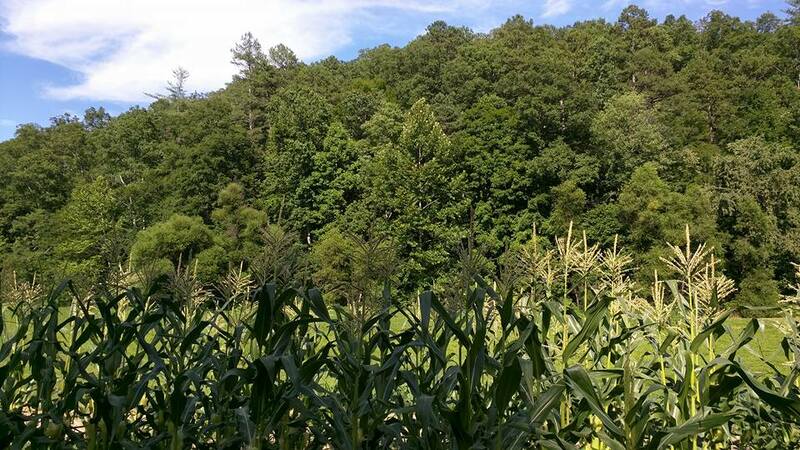 Mamaw and Papaw always raised a big old garden on their farm in Eastern Kentucky, and corn was one of their yearly crops. 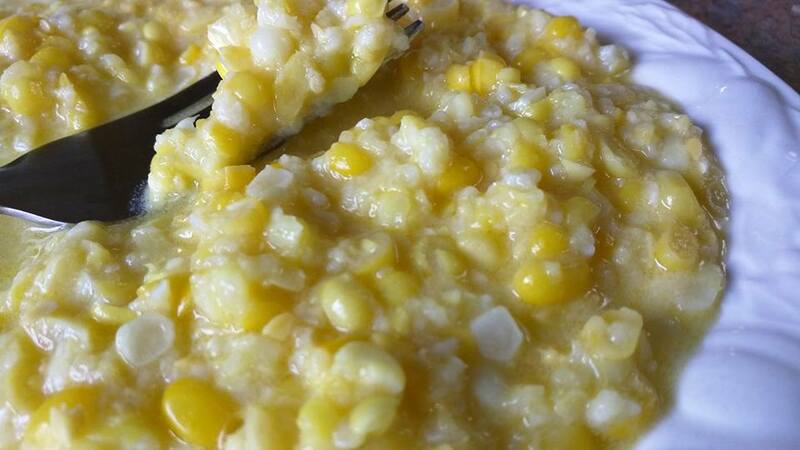 My mamaw became an absolute expert at making a delicious and old fashioned style creamed corn. Growing up, I almost always heard it shortened to "cream" corn, so that is what I've titled it here...Traditional Kentucky Mountain Cream Corn! Now, to be fair, there are a lot of recipes out there for homemade cream style corn, but from what I can tell...a lot of them call for adding milk or cream to the corn to achieve the "cream" portion of the recipe. 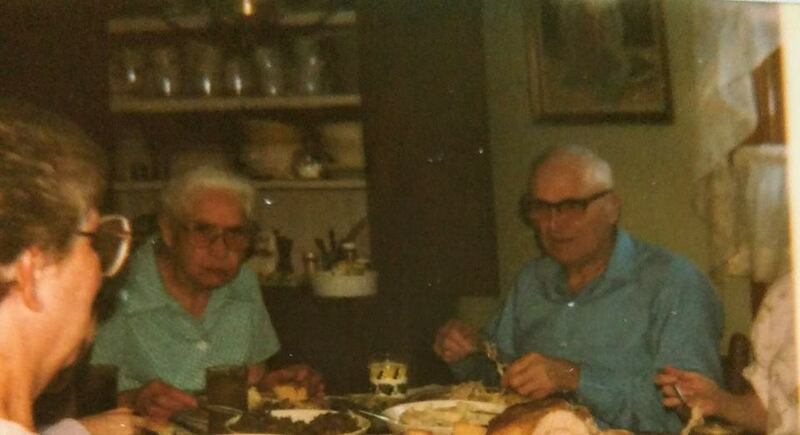 Here's where my Mamaw's cream corn differed...and was truly old timey. The "cream" in her cream corn was always achieved by a method rather than an added ingredient. 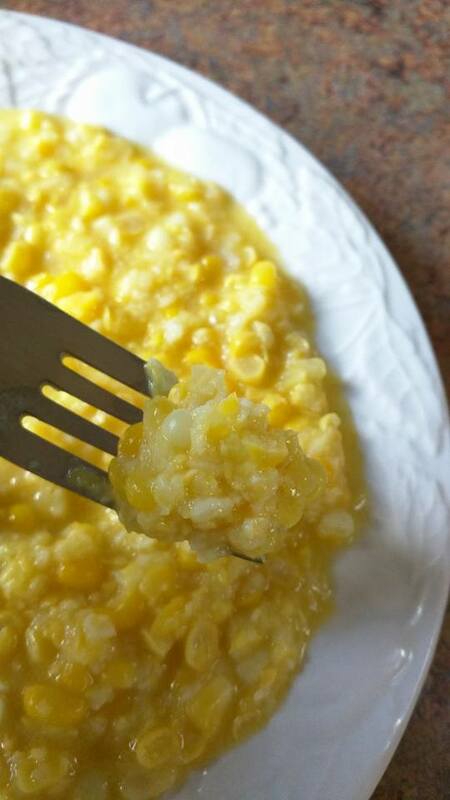 And this left her recipe with the purest taste you can imagine...full of rich, fresh, undisguised, and undiluted corn flavor. It tastes like pure summer downhome mountain magic on a plate! 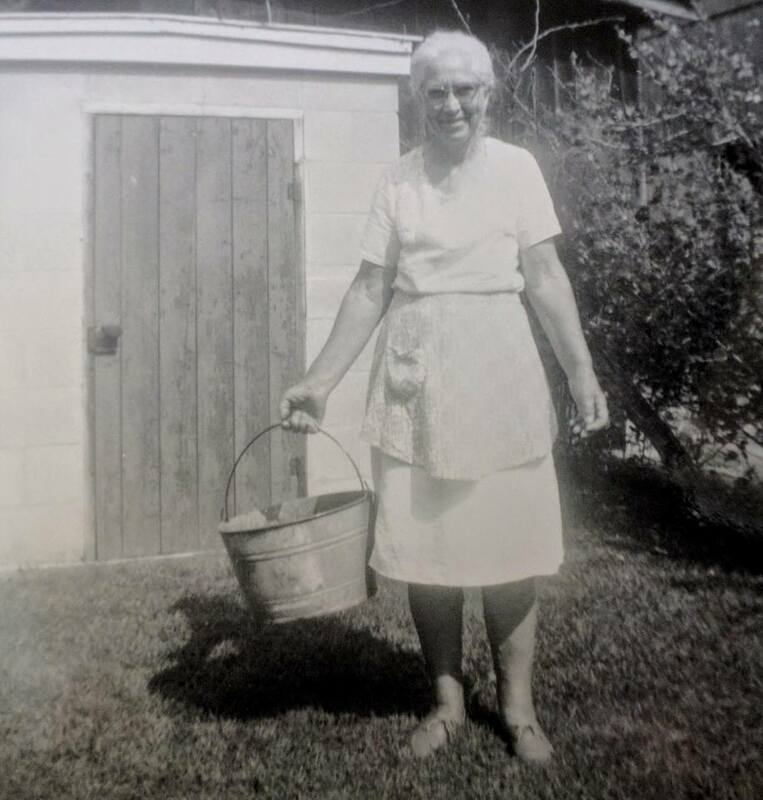 Mamaw out working on the farm....maybe she was getting ready to go gather some corn in that old tub! 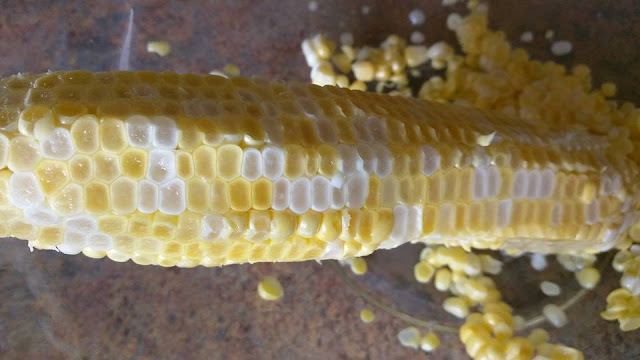 If I close my eyes when I eat a bite of this cream corn, I can almost hear the old green dishes rattling as the supper table was being set at my mamaw's house so many times during my childhood visits. I can clearly see, through the white draped dining room window, the early evening fog settling over the hills after a hot, humid summertime day. 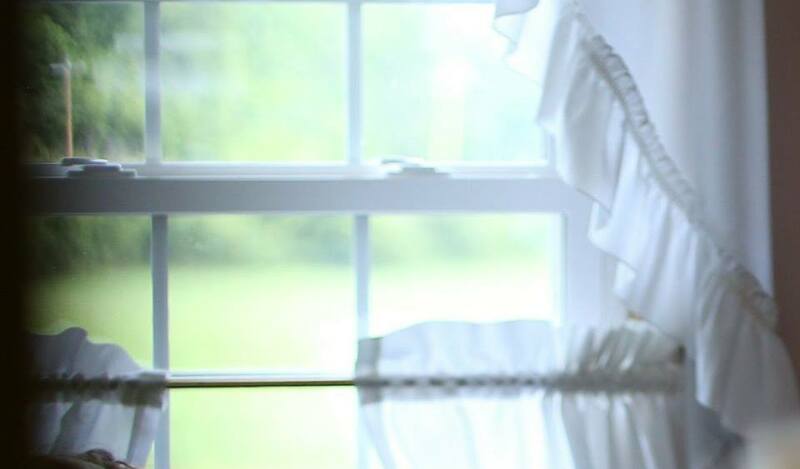 The white draped dining room window in my Mamaw and Papaw's Eastern Kentucky farmhouse. I can see Mamaw and Papaw and Aunt Oh So Sweet...and all of us around the table, sharing yet another meal made up of the bountiful goodness from their mountain garden. Mamaw, Papaw, and Aunt Oh So Sweet gathered round the table. I know I may be carrying on a bit about corn, but believe me, this corn is something special... You really need to just try it for yourself! Shuck and de-silk the corn. 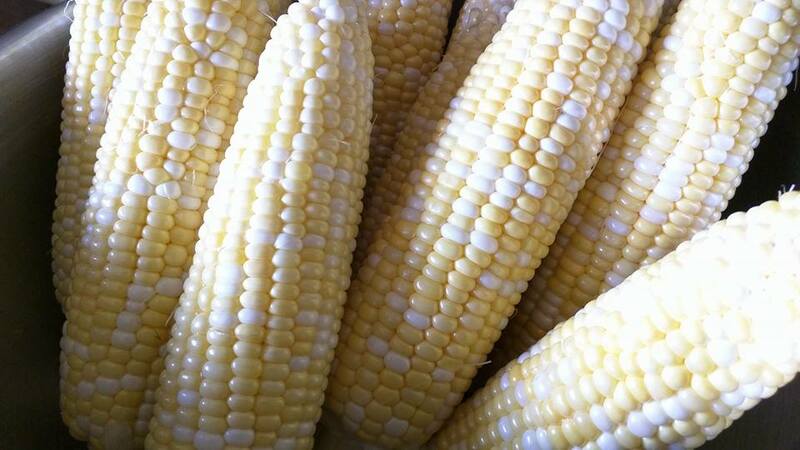 I used a bi-color corn here, but any good, fresh sweet corn should do. 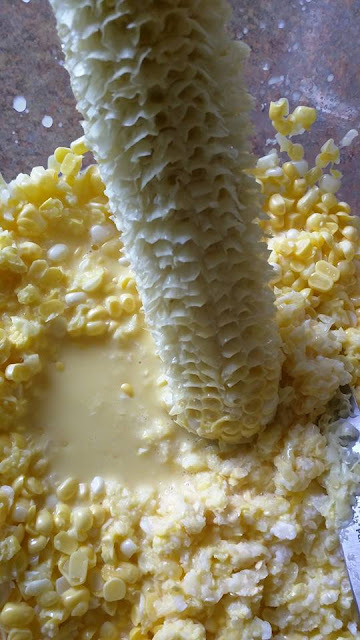 In a very large mixing bowl or dishpan, hold each ear of corn on it's end and cut a very shallow amount of corn off all around each cob with a sharp knife. You really want to make sure you take a very shallow "shave" off the corn. Just enough to take off no more than maybe the top third or so of the corn kernels. This is what was left on my corncobs after the initial cut. 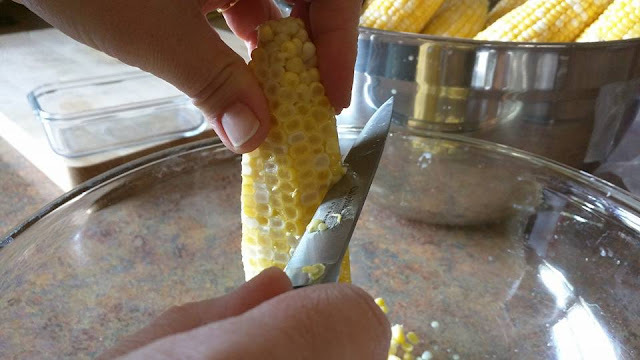 Next, turn the knife and lay the sharp part of the blade perpendicular against the corn cob and carefully scrape the blade down the length of the cob. 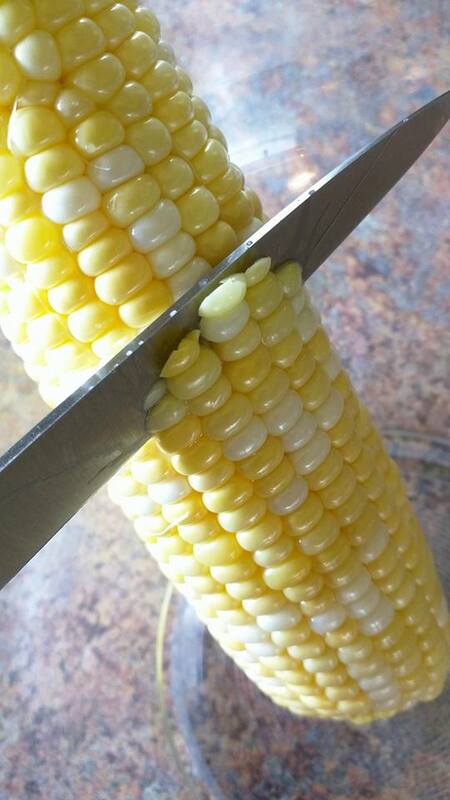 Be careful not to cut yourself during this process...the corncob can easily slip! Do this until the cob is scraped fairly clean. It may take several scrapes with the knife to complete the job. 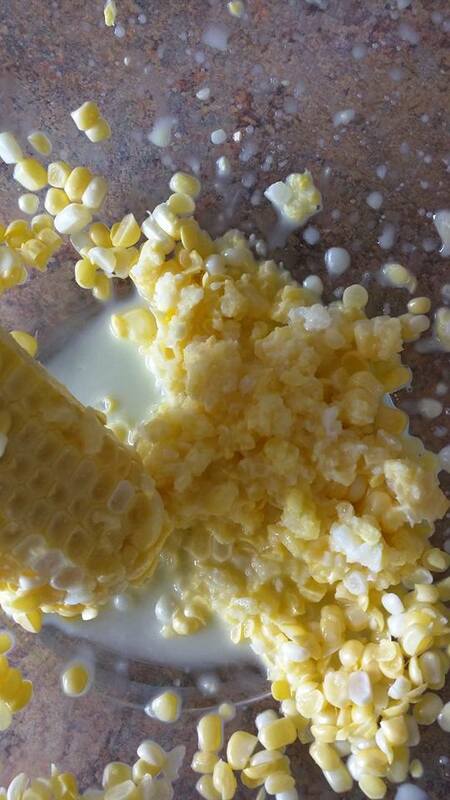 It is this action that "creams" the corn, and releases the natural "milk" found in the kernels. 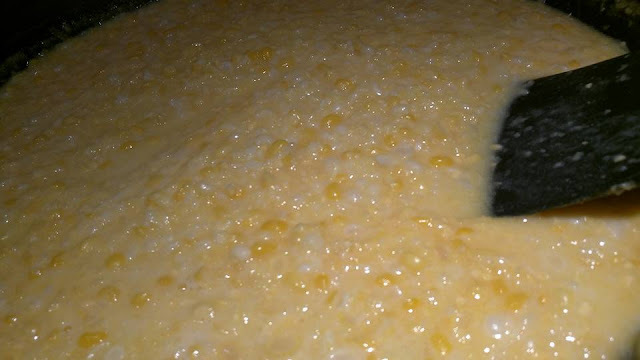 See the "milk" starting to form in the bowl as the first cob is scraped? Jackpot! Be prepared for a bit of extra kitchen cleanup from this, as the scraping can get a little messy, but oh how worth it in the end! This is what your cobs will look like when you have finished scraping. Once each cob has been cut and scraped clean, in a very large skillet, over medium heat, begin to melt a stick of butter. 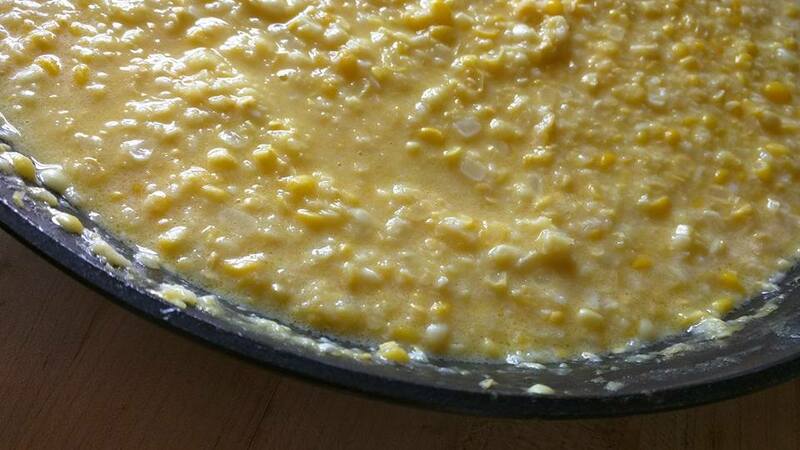 Add the scraped corn to the skillet. Next add about a 1/2 tablespoon of granulated sugar and one tsp. of salt and stir. I know that this is sweet corn, but adding sugar just helps pump up the flavor. I wouldn't skip this step, and my mamaw usually didn't either. Finally, if desired, (and, trust me, it will be very desireable) add around a tablespoonful of bacon grease to the corn. Now this step is totally optional, but I find that it just takes this recipe over the top! I "happened" to have some fresh bacon grease for the recipe...but saved bacon grease will do just as well! 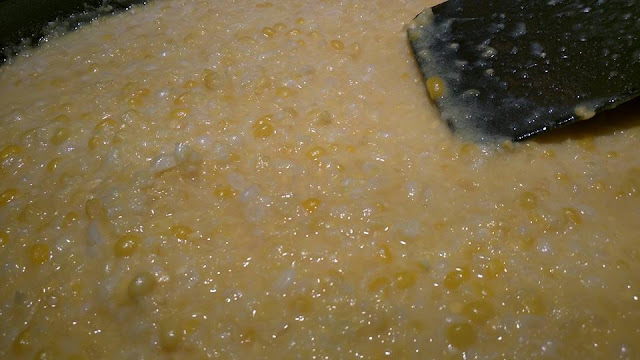 Continue to stir and cook the corn in the skillet until tender and done...this could take anywhere from 10-20 minutes or so depending on your stove and taste. I usually like to let it cook until the cream portion takes on a slight thickness. Best way to check for doneness though is to take a small taste. (Now remember I said a "small" taste...because you may need some willpower not to devour the whole skillet right then and there...not that I'm speaking from experience or anything!) Reduce the heat as needed to keep the corn from burning as it cooks. 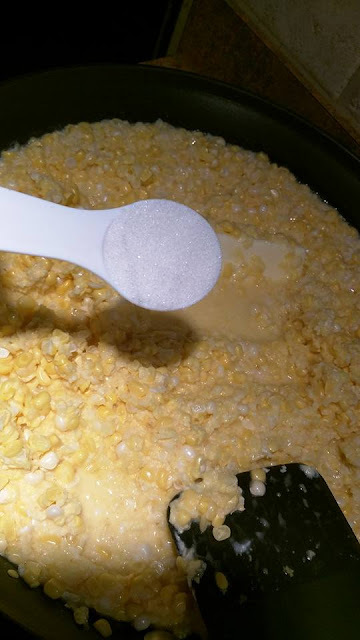 The corn here is thickened and just about done...you can see it start to slightly coat the spatula. Once the corn is done, serve right away, or allow to cool down to just warm and freeze in a sealed container or freezer bag. 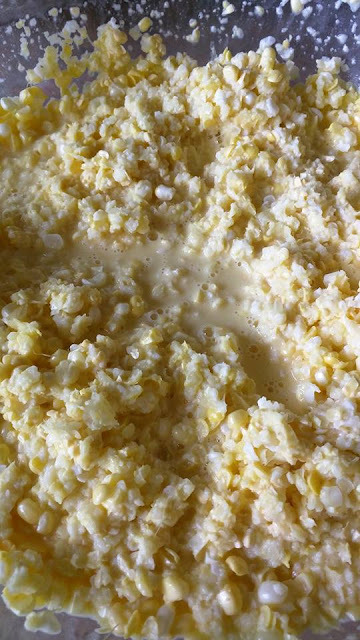 My mamaw always froze several containers of cream corn every year...and whenever I make a batch, I always make it ahead of time and freeze it as well. That way I have a wonderful side dish that can easily just be reheated on the stove top or in the microwave. If you make it now while the sweet corn is fresh you can even freeze it for Thanksgiving! You can microwave the corn until completely reheated...so so easy. Or if you don't want to deal with reheating it at the last minute on Turkey Day, defrost it early in the microwave and then pop it in a slow cooker until time to serve. Delicious! Believe me, it will wow your guests! The taste just shouts summertime on Mamaw's farm in the hills of Appalachia! Hurry...go get yourself some corn and head to the kitchen! If you, like me, were blessed enough to have some great childhood memories of spending time on your mamaw and papaw's farm somewhere in the beautiful southern Appalachian mountains...I hope this recipe stirs up fond thoughts from your past. And I hope you take the time to find ways to celebrate the blessings you gained from your mountain roots and experiences. Mamaw and Papaw holding me as a baby. I gained so many blessings from these two! And don't forget to share those experiences and blessings with others who may have never heard positive things about Appalachia. 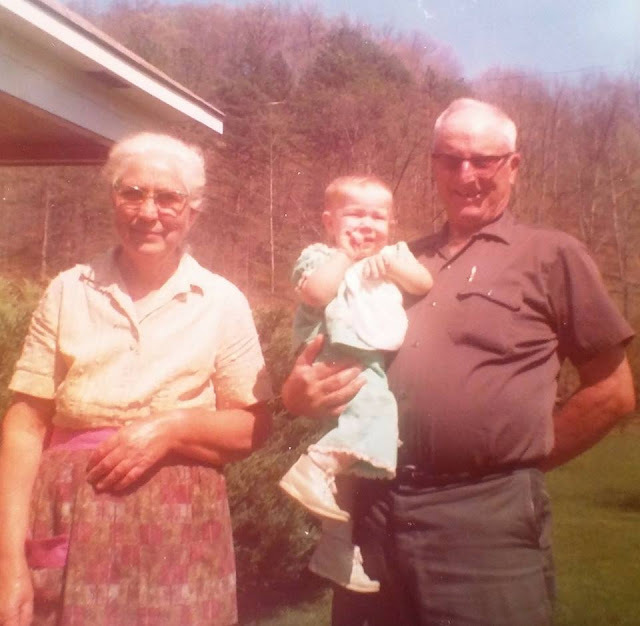 Appalachia deserves to have the world hear a more complete and accurate version of its story. 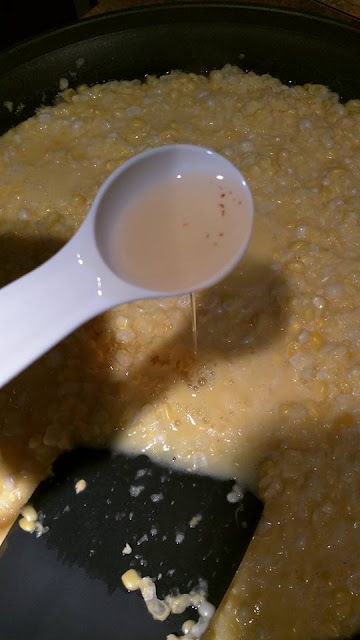 The actual recipe for Traditional Kentucky Mountain Cream Corn is below. Click here for a printable version. I hope you enjoy it! See you next time. In a large mixing bowl or dishpan, cut off a very shallow amount of corn from all around each cob. 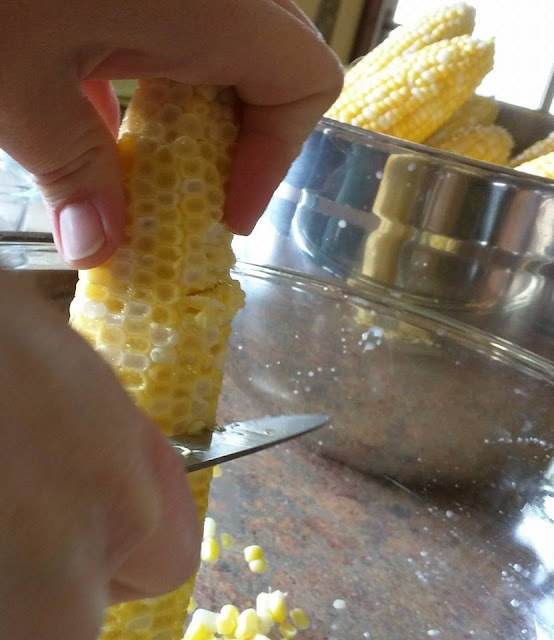 Next, holding the sharp blade of the knife perpendicular to the cob, scrape down each cob with the knife, releasing the liquid and remaining portion of the kernels, until the cobs are all scraped clean. 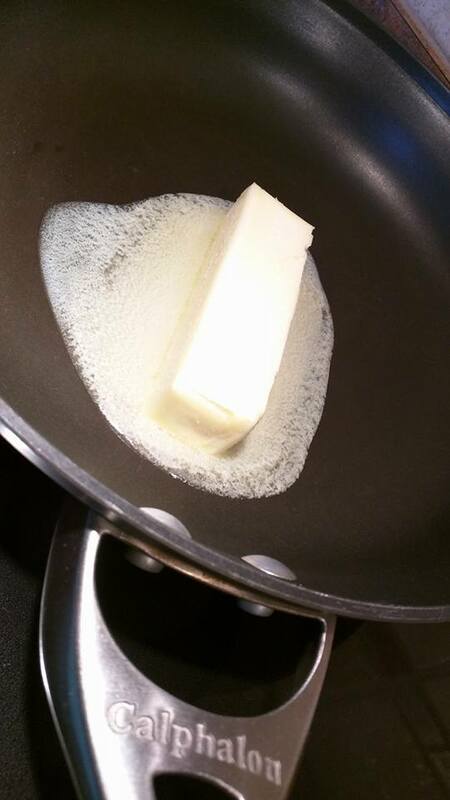 In a large skillet, over medium heat, begin melting butter. Add scraped corn, sugar, salt, and bacon grease. Cook, stirring often, and reducing heat as needed, until slightly thickened and done, approximately 10-20 minutes. Serve immediately or allow to cool enough to freeze. 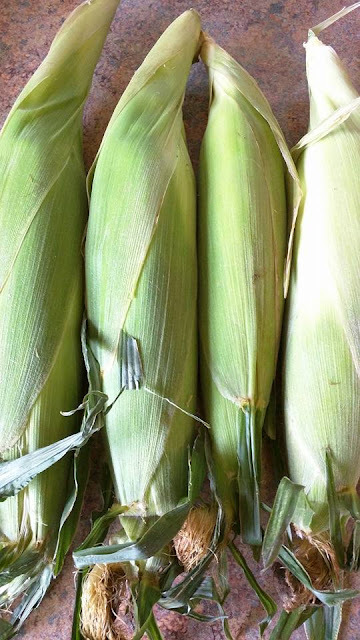 From frozen, corn may be re-heated via microwave or stovetop. Corn dishes are very popular in our country side as well as the sole crop being farmed here is corn. 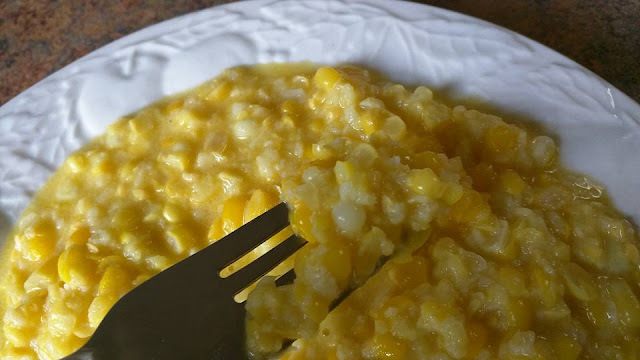 Good to read about another corn recipe here on your blog and good to see your family pics also.